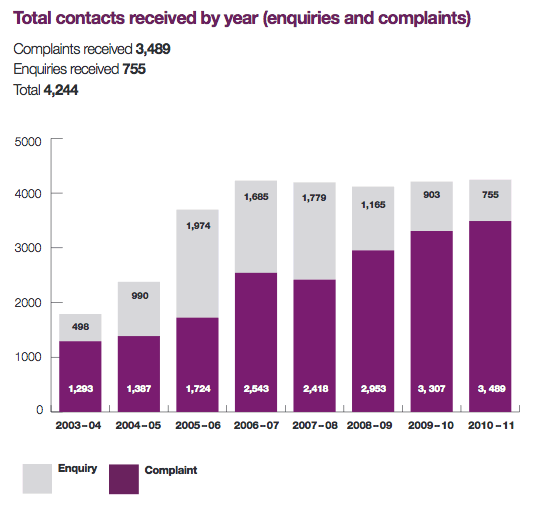 "Too many authorities are getting complaints wrong first time, rather than right first time"
The Ombudsman’s key message from the 2010-11 annual statistics is to service providers about the quality of service provision and complaints handling procedures. Too many authorities are getting complaints wrong first time, rather than right first time. When making decisions on complaints in 2010-11, we upheld or partly upheld 34% of all the complaints that were valid for SPSO (i.e. cases that had completed the organisation’s complaints process and were within our jurisdiction). To put this another way, in over a third of cases that had already been investigated by the local service provider - through multiple, often lengthy stages of review and appeal - that provider got something wrong. This clearly demonstrates a need for change, and through our Complaints Standards Authority we are working with organisations in the various sectors under jurisdiction to simplify processes and improve complaints handling. It is not possible to make a direct comparison between this 2010-11 figure and figures for previous years. This is because we only began to record the outcomes of decisions (other than those in published investigation reports) in this way after Jim Martin, the current Ombudsman, took office in May 2009.